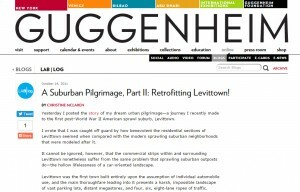 A Suburban Pilgrimage, Part II: Retrofitting Levittown! Yesterday I posted the story of my dream urban pilgrimage—a journey I recently made to the first post–World War II American sprawl suburb, Levittown. I wrote that I was caught off guard by how benevolent the residential sections of Levittown seemed when compared with the modern sprawling suburban neighborhoods that were modeled after it. It cannot be ignored, however, that the commercial strips within and surrounding Levittown nonetheless suffer from the same problem that sprawling suburban outposts do—the hollow lifelessness of a car-oriented landscape. Levittown was the first town built entirely upon the assumption of individual automobile use, and the main thoroughfare leading into it presents a harsh, impossible landscape of vast parking lots, distant megastores, and four, six, eight-lane ropes of traffic.